President Muhammadu Buhari on Friday in Abuja assured stakeholders from the South-East that the region will benefit more from roads and coastal rail projects to boost the nation’s economy. He told leaders from the region led by Deputy President of the Senate, Ike Ekweremadu, that 2nd Niger Bridge, East-West road and the Coastal Rail project were receiving utmost attention from his administration. The President said that counterpart funding from the Chinese government would substantially fund the projects, which when completed, would improve the welfare, well-being and economy of the region. “I know the Chinese are very competent in handling such projects and we will ensure that we get the money for the projects to take off. I thank you for articulating your demands and I want to assure that we are doing our best for the country. If we can stop people from stealing, then there will be more resources to put into projects that will create employment for Nigerians,” he said. 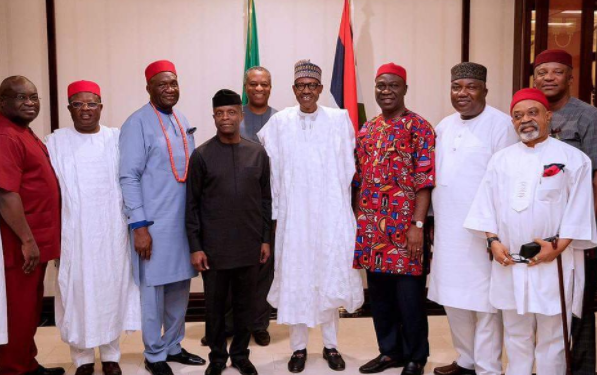 He also promised the leaders, comprising governors and ministers from the region, president of Ohaneze Ndigbo, Nnia Nwodo and representatives from the National Assembly, that he will visit states in the zone soon. “I want to assure you that I came into government with a clear conscience and I will also leave with a clear conscience,” he said. Earlier, Nwodo had articulated the demands of the zone and highlighted issues of state creation, restructuring, federal projects – Enugu-Onitsha road, Enugu-Port Harcourt road and Aba-Ikot-Ekpene road, among others. Nwodo also demanded urgent presidential interventions on the Enugu Airport, reticulation of the gas pipelines in the South-East and the standard gauge plan for railway construction. “We are ready to work with you; we are determined to work with you. We know you are a decisive leader and we know God will continue to give you the wisdom to govern Nigeria,” Nwodo declared. In his contribution, Governor Dave Umahi of Ebonyi expressed satisfaction on the outcome of their discussions with the president on critical issues affecting the region. “You have no hatred for any state. You have treated all states with equality. What one state gets in the north, the other gets in the south,” the governor said.